Arbutus Avenue, Renmore: potential for development. Set on a large site, Number 11 Arbutus Avenue in Renmore is not your typical semi-detached property, as it comes with strong potential for an additional residence in the garden to the side (subject to planning). Situated close to Galway City, the property is conveniently positioned in the popular Renmore area overlooking a green area. 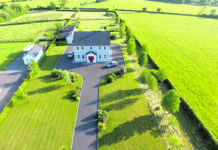 The location is well connected by bus services with local shops, sports clubs and walking trails like the beautiful Ballyloughane beach within walking distance. Constructed in 1975, the property comprises a 4/5 bedroom semi-detached residence with extensive gardens to the side and rear offering significant potential for the development of a separate dwelling. Measuring 1,541 sq ft and in good condition, generous living accommodation includes a converted garage, large utility and a partially developed attic space with a stunning view over Galway Bay. A bright entrance hall leads to two reception rooms, each with an open fireplace. The kitchen/dining opens through to the utility into the converted garage which was cleverly transformed into a downstairs bedroom with electric shower. Upstairs, there are four bedrooms and main bathroom. The side garden is large enough to accommodate a single detached dwelling, while still leaving a large garden with the existing residence.